fluorescent indoor grow lights can sometimes be used for the vegetative stage of plant growth. If your vegetative area is very small....for example, it will fit under 3 standard 4' fluorescent light fixtures, and you rarely have plants larger than 20 inches tall (i.e. lettuce, spinach, basil), I would advise you to use standard fluorescent shop lights exclusively. Use bulbs with the highest number of lumens you can find. Lumens=usable light to your plants. 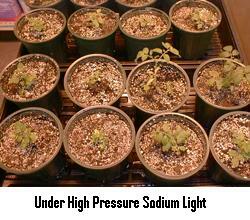 Standard fluorescent lights will not be strong enough for most indoor gardening uses. When your vegetative area starts getting a little larger than 2' x 4', when you are growing plants larger than 20 inches tall vegetatively, and when you are growing vegetables or flowers under a flowering light cycle, your plants will require a light with more power than a standard fluorescent light can provide. In this case, using a metal halide grow light for the garden area is a great option. I always prefer to keep the heat from the grow light out of the garden by using a fully enclosed reflector that can be air-cooled. Look for a vent hole size of 6 inches (or bigger) to ensure efficient cooling of the grow light. Flowering plants stretch in the absence of blue light. 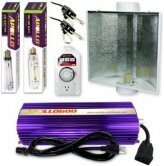 It is the blue light that keeps your growing plants short and stocky. Metal halide grow lights put out intense light high in the blue spectrum. It is the reason why metal halides produce a light that looks more white, compared to light from a high pressure sodium light (which looks more orange or yellow). and always be sure to use an oscillating fan on your plants, (with the exception of your fresh clones). 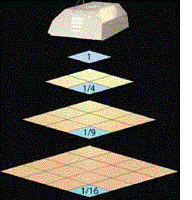 Below is a general guideline on how close to keep the tops of your plants from the bottom of your metal halide indoor grow lights. A good indoor/outdoor garden thermometer will help you determine if you can go closer or need to stay farther in your own setup. Metal halide indoor grow lights, as well as "cool" white fluorescent lights, are very high in the blue light spectrum. Blue light is more beneficial to the healthy development of stems and leaves rather than the healthy development of fruits, vegetables, and flowers. For this reason, these grow lights are often used during the vegetative stage of plant growth. The high pressure sodium light, on the other hand, is high in the red and orange light spectrum and very low in the blue spectrum. The orange yellow light encourages the healthy development of fruits, vegetables, and flowers. Upon flower forcing, a quick change in spectrum from a metal halide light (white/blue) to a HPS light (yellow/orange) makes many plants go into flowering very aggressively. This is why many people use a metal halide for vegetative growth, then switch to a high pressure sodium light for the flowering stage. There are also many successful gardens that use HPS lights for both the vegetative AND flowering stages, or that use Metal Halide lights for both the vegetative AND flowering stages. Both lights are very intense, and capable of producing excellent results when used properly (including during flowering). TIP- Changing from a vegetative photo-period to a flowering photo-period at the same time you change from a blue light spectrum to a red/orange light spectrum makes the plants very eager to begin flowering! 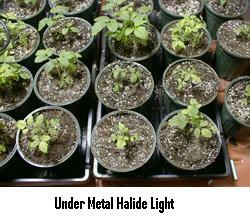 Metal halide light is much too intense for seedlings and clones unless they are kept 3 or 4 feet away. This is a job much better suited for fluorescent grow lights. It will also cost much less on the electric bill this way, and will be much easier to keep the clone area at a comfortable 70 degrees.